The Rodney District Council has blown up a car with the force of 10 grenades, placing the reassembled pieces on a weekend-long display, and recreating the explosion for a television commercial. All with the help of Saatchi & Saatchi, Flying Fish, Images & Sound, and $10,000. 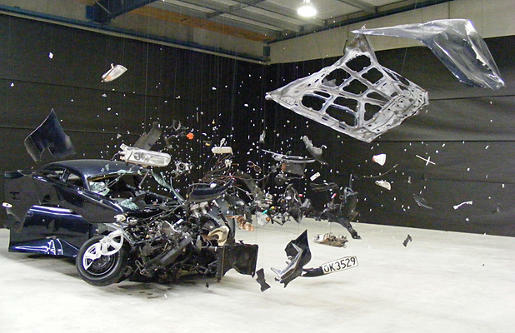 Engineers worked out that two cars colliding at 125km/h had the equivalent force of 10 grenades. Explosives were packed in front of the car, and the moment after detonation was captured in the elaborate exhibit. The Grenade campaign was developed at Saatchi & Saatchi NZ by creatives Matt Swinburne and Mike Felix, creative director Luke Chess, executive creative director Mike O’Sullivan, and agency producer Richard Mayo Smith, account director James Polhill. Filming was shot by director Luke Savage via Flying Fish Films, with producer Anna Stuart, director of photography Andrew Stroud, executive producer James Moore. Post production was done at Images & Sound by colourist Paul Lear, Flame artist Brenton Cumberpatch, producer Lucy St. George. Editor was Nathan Pickles. Steadicam operator was Alex McDonald. Camera was supplied by Redreampix.com Installation was by 360. Music is ‘Lullable’ by SJD, from their 3 album. See Hazel Phillip’s take on the campaign at National Business Review.